(Nanowerk News) Hot summer days cause in large cities very seldom great happiness among inhabitants. On those days the air is highly polluted with automobile and industrial emissions what makes breathing difficult and unhealthy. According to the latest calculations of Max Planck scientist Andrea Pozzer this scenario could become true for most of world population in 2050 if no counteractive measures are taken. Especially China, North India and the Middle East are expected to be affected by a drastic decrease in air quality. In 2050, the air quality worldwide will be as bad as it already is nowadays in urban areas of Southeast Asia. This is the result of a simulation of the atmosphere done by scientists at the Max Planck Institute for Chemistry, the Institute of Atmospheric Physics and the Joint Research Centre of the European Commission. The chemical atmospheric model EMAC used by the researchers for their current study is the first to include all five major air pollutants known to negatively impact human health: nitrogen dioxide, sulphur dioxide, ozone, carbon monoxide and particulate matter smaller than 2.5 micrometers which are regarded as particularly harmful. The MPI (Multipollutant index) describes the degree of air pollution, by summarizing pollutants with effects on human health (i.e. ozone, particulate matter, carbon monoxide, sulfur oxides and nitrogen oxides) in a single value. 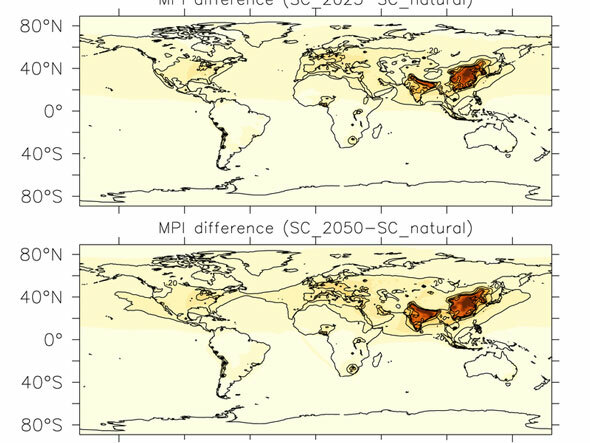 A natural scenario (without human-induced emissions) is here compared with a simulated scenario for 2025 (top) and 2050 (bottom). The simulations describe the air pollution as a global problem. The yellow tint base means that the level of air pollution can affect human health. Orange and red areas indicate the calculated hotspot with hazardous air quality. Especially Asia and India are affected. Air pollution is one of the major current health risks of humanity. At present, urban outdoor air pollution causes 1.3 million estimated deaths per year worldwide, according to the World Health Organisation. That number will increase in coming years. Therefore Andrea Pozzer and his colleagues studied the impact of man-made emissions on air quality in different regions of the earth. They show, what could happen if no further action is taken to reduce pollutants. “Our study shows that further legislation to control and reduce man-made emissions is needed, in particular for eastern China and northern India, to avoid hot-spots of elevated air pollution," says Andrea Pozzer of the Max Planck Institute for Chemistry in Mainz, whose latest research findings are published in the current issue of Atmospheric Chemistry and Physics, a journal of the European Geosciences Union ("Effects of business-as-usual anthropogenic emissions on air quality"). According to the results of this study eastern China and northern India are the places that are struggling with the highest pollution levels.